Although offering exceptional garage door repair services is our bread and butter (it's in our name, after all), that's not all we do. 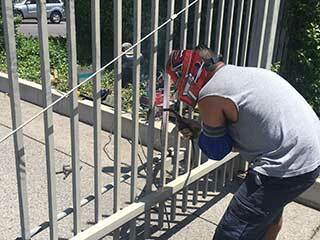 Our team also specializes in performing gate repair and ensuring that things like the opener and intercom, as well as the track and rollers, are in great working condition. There are all sorts of problems your automatic sliding gate can experience, but whatever they are, rest assured that our technicians can handle them. While repairing these automatic mechanisms is one of our strong suits, it's not all we do. We also perform a variety of installation and maintenance services. That means that if you're interested in getting a new intercom system, or even a new swing gate installed, you can consult with our experts to make sure you get the best choices possible. Similar to your automatic garage door, most gate systems also use an electro-mechanical opener in order to automate their performance. These devices can experience a few different malfunctions and must be handled by professionals when that happens. Our technicians are highly skilled at addressing such problems when they occur, and we can perform any sliding gate motor repair as well as fix issues with the opener's safety sensors and the circuit board. If your system starts reversing unexpectedly, or slams against the end of its track, our experts can help. The chain that your opener uses (if it's of the relevant type, that is) to open and close your gate must not be too tense or too loose. Chain adjustment may be required from time to time in order to make sure the motion stays as consistent as possible. However, eventually, chain replacement may be required. The condition of the sprocket and idle wheel will also need to be checked to ensure they're still capable of serving their purpose. If they too need to be replaced, you can count on our technicians to take care of it. Our team also performs gate intercom repair. We have a wealth of knowledge of the modern systems used today and our technicians are experts at dealing with common malfunctions that can trouble them. Regardless of which type of video or audio intercom system you have, our team will be able to fix whatever's wrong with it. We also perform intercom installation services, and our experts will be happy to help you find a new model for your gate. When sliding gate rollers are worn, the system will struggle to move smoothly and will start grinding and squeaking, and may even get stuck. Regardless of their material and whether they are used for swing gates or sliding ones, they'll need to be replaced when their condition reaches a certain point. New wheels/rollers will ensure the stability of movement and ease of use too, so getting them replaced by experts is usually the right way to go. When a driveway gate is not properly balanced, it might become a threat to your safety or it might not close or open properly, and suddenly leave you locked in or outside of your premises. Hinge problems can often result in such problems, which is why it's important to make sure their pins are lubricated and their condition is good. If welding repair will be required, you can trust our team to complete it quickly and safely. No matter what type of problem you're having with your residential or commercial gate system, you can always count on our team for assistance. Don't hesitate to contact Garage Door Repair Forest Park for anything from wrought iron gate installation to various types of track and opener related problems.